In 552 AD, the Korean state of Paekche introduced Buddhism to the Japanese Yamato court. They presented an image of Buddha, with a collection of scriptures. Then, just a short time later, a group of experts arrived from Korea. These men were well educated in the Chinese classics, medicine, music, calendars, and in divination. At first, many Japanese conservatives refused to follow the new religion. However, the Soga family, who were highly regarded managers of royal estates, chose to embrace it. Then, a short time later things would change dramatically when a violent struggle for imperial succession occurred and the Soga became the dominate faction in the Yamato court. At this time, the Soga family initiated closer relations with the Chinese mainland, in an attempted to transplant all of China's intellectual achievements. Their timing couldn't have been better, the Sui had just reunited China after more than 300 years of division. China was now the most powerful and advanced country in the world. Before the end of the century, Buddhism was the religion of the Japanese power elite. In 593, Soga empress, Suiko, seized the throne and became the ruler of Japan. Immediately, she placed the real power in the hands of her nephew Prince Shotoku, who was also a Soga. 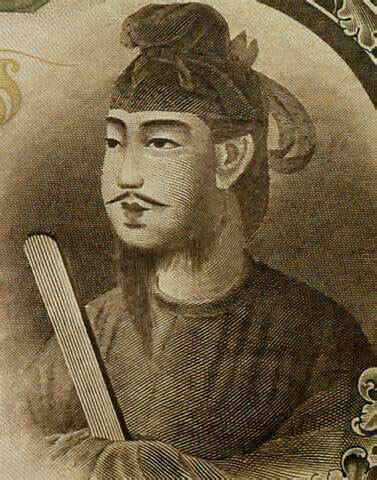 Over the next ten years Prince Shotoku and his followers would revolutionize their native Japan by further assimilating into the Chinese culture. Before long, the prince introduced Chinese methods of bureaucratic rule. The Chinese system favored promotion based on merit. Then in 604 AD, Prince Shotoku introduced his new “Seventeen Article Constitution.” Under the constitution, all citizens were subjects, and they owed total allegiance to the supreme ruler or Tenno. Shotoku's new constitution centralized the government. At the same time, it stressed the importance of both Buddhism, and the teachings of Confucius (551-478 BC). During the same year, the Japanese started using the Chinese calendar. Prince Shotoku praised loyalty, diligence, and self-control because they all contributed to harmony. Prince Shotoku dispatched the first of three diplomatic missions to China in 607. His official letter to the Emperor of China, referred to Japan for the first time as the “Land of the Rising Sun,” and to China as the “Land of the Setting Sun.” It was Shotoku's intention to imply that they were equals. At the same time, he established the first Japanese embassy in China. Trade between the China and Japan involved a sea voyage of over 500 miles through hostile Korean waters. Despite that fact that over the next 25 years, hundreds of missions would occur linking the two countries. Many of these missions included exchanges of monks, painters, musicians, new emigrants, and craftsmen. Prince Shotoku became well versed in the Buddhist sutras. He constructed numerous monasteries. At the time of his death, there were 46 Buddhist temples in Japan with 1,345 nuns and monks. Over the next 75 years the number of temples would increase ten-fold. Before long, cults centered on the teachings of Prince Shotoku emerged. Cult followers believe that Shotoku was the incarnation of Buddha. Today, the prince is one of Japan's most revered heroes. His face adorns the 10,000 yen banknote.